This crowdfunding startup wants to be the bridge between declining advertising revenues and paywalls with low conversion rates. Schmidt, Christine. "PressPatron is getting readers to pay what they want for news — with an average one-time contribution of nearly NZ$50." Nieman Journalism Lab. Nieman Foundation for Journalism at Harvard, 17 Aug. 2017. Web. 23 Apr. 2019. Schmidt, Christine. "PressPatron is getting readers to pay what they want for news — with an average one-time contribution of nearly NZ$50." Nieman Journalism Lab. Last modified August 17, 2017. 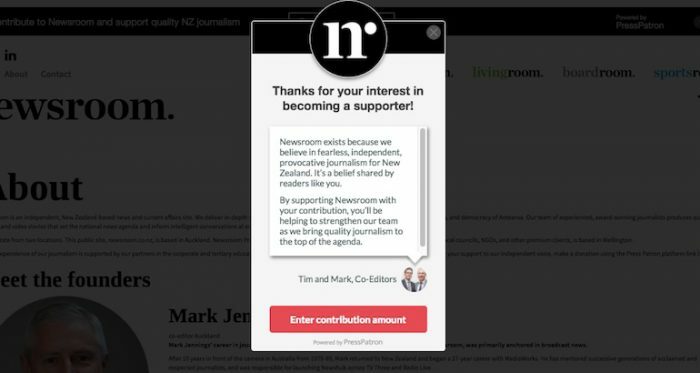 Accessed April 23, 2019. https://www.niemanlab.org/2017/08/press-patron-is-getting-readers-to-pay-what-they-want-for-news-with-an-average-one-time-contribution-of-nearly-nz50/.